This week has been a week of blessings. I’ve been pretty busy getting ready for Christmas, finishing up the last week of school before the holiday, and my regular chores. To top it off, Lovana’s work asked Ja’Ana to wash dishes over the holiday break for a few hours on a few days this week and next. So, there’s been an interview, and training so far, and she starts tomorrow at 9. Thankfully, this place isn’t far from our home, as I am driving both of them now most of the time. I had them walk home today, as it was mid-afternoon and not rainy or dark. I’m happy for her–a little money will be welcome, and it won’t interfere with school. So, that was an unexpected blessing for her. I cooked a bunch of food during week. 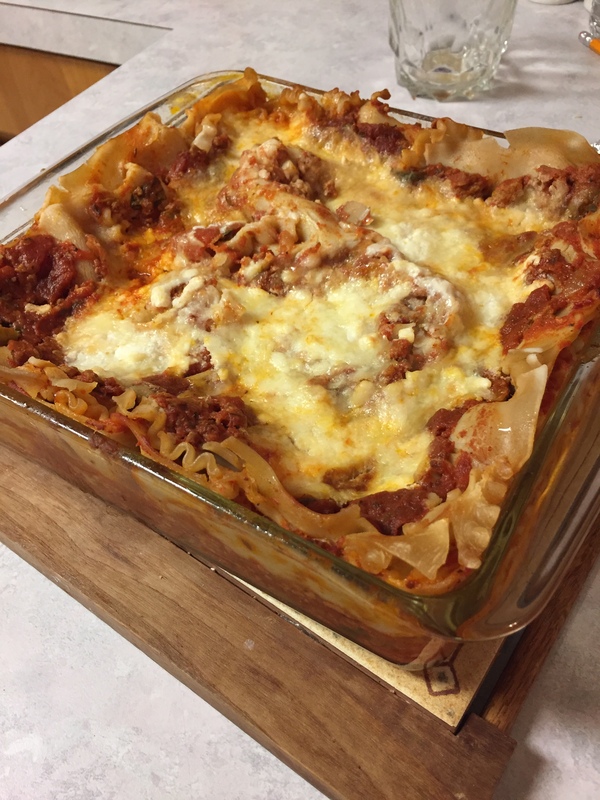 I made a couple of lasagnas, and froze some pieces for later. I cooked a roast beef with horseradish. I also did a pork roast with salsa verde. What’s left will be used for taco filling, or pulled pork sandwiches. When we went to my oldest daughter’s house to celebrate Christmas on Saturday, she sent us home with a bunch of baked potatoes. So, today, I made hash with roast and potatoes in a frying pan for dinner. BECAUSE….my microwave broke! It’s been over a week. I keep forgetting it is gone, and turn to pop something in there, but….it’s still gone every. single. time. I will be replacing it, but I have been too busy to shop properly and feel I will just grab the first one I see if I go to the store, so I’m waiting until I have time. 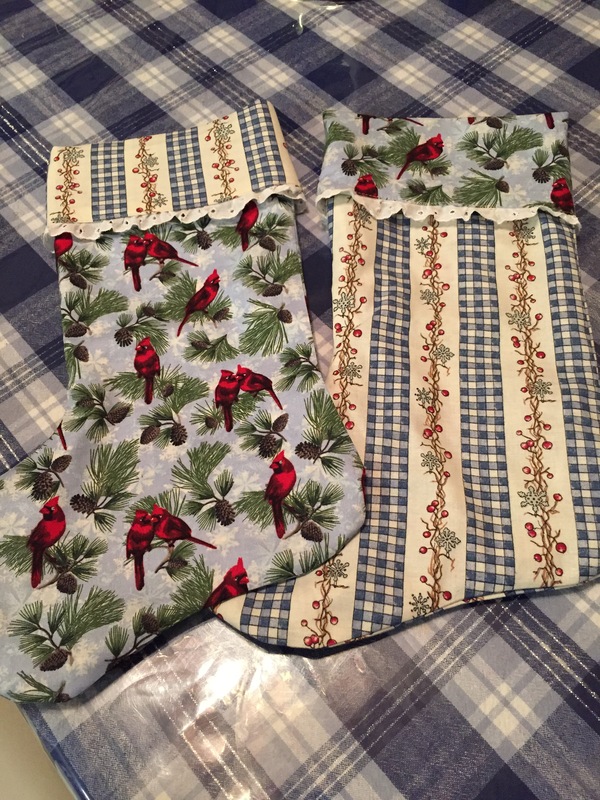 I made a couple of Christmas stockings from some fabric I had on hand. I wrapped a lot of presents with gift bags recycled from other years and wrapping paper bought on clearance 3 years ago after Christmas. I’ve been so happy with the poinsettia Rob bought for me, sitting on the piano with the nativity scene next to it. My tree is giving me so much enjoyment. 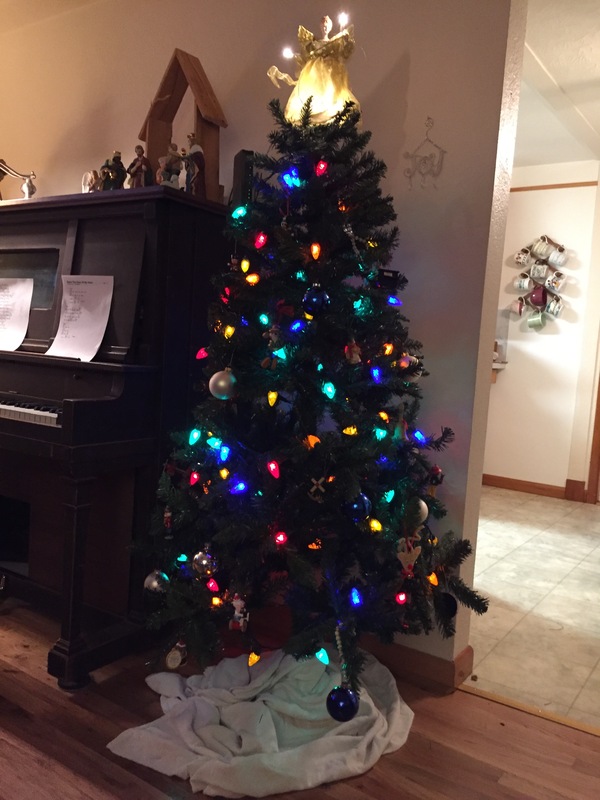 It was very nice of Harnet to give it to me, and God knew it would fit in the small space I had and make things so much more cheerful then they were last year with the tree in the garage. I was sitting with Harnet on Friday, drinking coffee, and it was such a blessing to visit with her about how God has met my needs over the past couple of years, and hear how God has been meeting hers, too. It was good to take the time to just rest and encourage each other after the hustle and bustle of the errands we ran. Last week, I was able to spend some time visiting with another friend I’ve not seen for a while. I was also very uplifted and encouraged during the time I spent with her. Sometimes, a girl just needs some visiting time, and I feel very blessed to have gotten some 2 weeks in a row. While we were doing one errand, we dropped Ja’Ana off at the library with Danait. 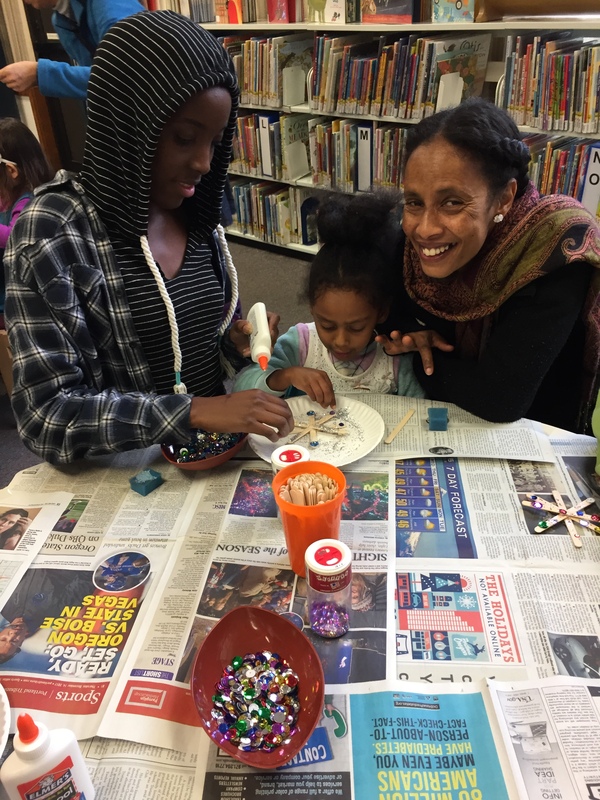 They went to story time, and soon after we returned, it was craft time. They had stories about snow, and made snowflakes. Of course, she wanted her Mommy to see what they were doing. 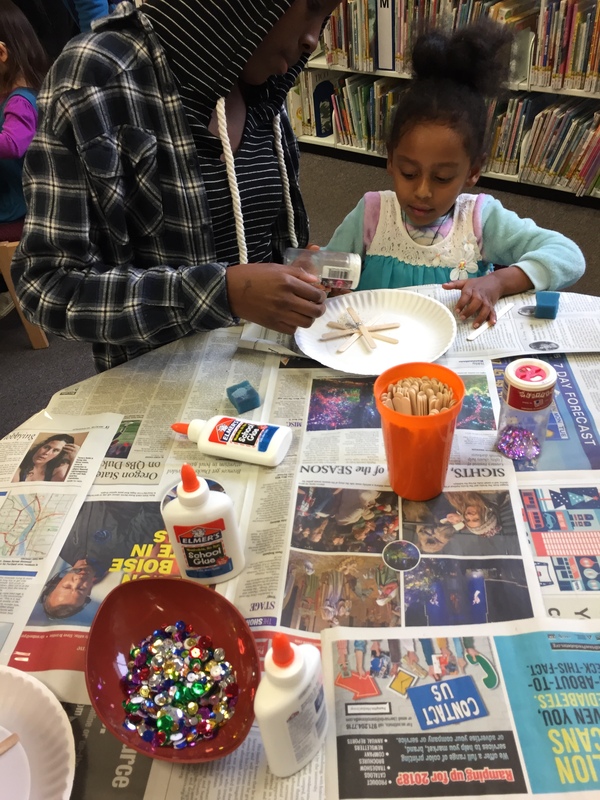 It is such a nice service of the library to provide all the stories and supplies for such fun crafts. It was SO nice to be able to know she was happy and entertained in Ja’Ana’s capable hands while we did what needed doing. During the course of the day, after much discussion and looking at Amazon, we found a new injera cooker to order for Harnet. Hers is broken and doesn’t work well at all, and discussion about this purchase has been in progress for a while now. She eats this injera bread daily, so it’s something she needs. She’s been saving for the purchase, and so on Friday, she made her final decision about which one she liked. All she really cared about was that it would cook the injera properly. All you can do is read the reviews, and hope for the best, but we found one that was the same brand and style as the one she has. I took the info home to Rob since he orders from Amazon more than I do, and I couldn’t remember our password at the moment. After several phone calls, and discussion, Rob and Harnet were both delighted when he not only ordered it, he found it on sale for a significant amount off, with free shipping! So, it turned out to be another blessing that I couldn’t remember that password at the time! It also was terrific that we didn’t have to drive around the streets of downtown Portland, searching for the (different than last time) store that supposedly had one, for full price….IF they even did have one, which was our other option. Today, Rob has a cold. He has 2 weeks off of school, so the first thing he did was get sick. I took the girls to church this morning, then came home to be with Rob. I felt very blessed to have a few hours with just him, as my sister took Patsy with her for the afternoon, and the older girls were at work. He’s already feeling a bit better, and we both got a lot of rest today. It’s a good thing–my week is busy as usual. I wouldn’t want it any other way! Injera cooker…hmmm. I do hope I see an instructional post coming in the future. Hint. Hint. I was fortunate that when our microwave died last year I had a spare in the garage because college kids think the parental garage is their storage place and they never remove said stored items! I did ask her if she was ever going to come and remove it before claiming it. I hope Rob is well soon and no one else gets sick but yes it is always a gift to have hubby time when you have a house full of kids. Now I will admit that I would really love some girl talk after all these months of him being home. I’ve never been one to get much girl time…too many children, always at home because we homeschool, etc., so I treasure it when I get it. Plus, I do miss my friends from my “old” life, so it was extra nice to reconnect with one of them. Love the stockings! I think a few years ago I bought a microwave at Walmart for $35, but it was a smallish one. I think Rob knows a whole lot more about it than I do—he’s talking about wattage, etc. It does need to be somewhat small, as that is the space this kitchen has for one–a small shelf the owner apparently built when he wanted a microwave, which I can respect being a “do-it-myselfer” but I need to make sure it fits. When Rob checked, they were around $100 or so, so he wants to check the prices on new ones. The Instant Pot is a great idea! Would I just put a bowl of leftovers on the rack and put it on for a couple of minutes? Or….how long? Girl, you are one busy bee. Sounds like a good week though. I’ve caught a cold too so I’m taking it easy for a day or two. I hope you get better quickly. Rob is already a lot better today than yesterday–he just rested a ton and it worked! Those stockings are very pretty! Sorry to hear that Rob has a cold, but glad he’s feeling better, already. How lovely that you and Rob were able to find the injera maker on sale and free shipping! I just wanted to share that in my house, the kitchen countertop space was really limited. So, when I could save the $$$, I bought a microwave/stove exhaust combination unit. It replaced the existing stove fan/exhaust unit and was installed above the stove.. Spendy but I loved it for how much space it saved on my countertops. Just something for you guys to consider. It also had a great light – full on for task lighting or a ‘night light’ feature. Mine was from Sears and was Kenmore brand. I was just about to suggest a microwave just like SJ in Vancouver BC did! We put one of these in a few years back and it really helped free up some counter space in my very small kitchen! My husband had to take out the cabinet above the exhaust fan to have it a proper distance from the top of the stove. I now have two open shelves with the microwave above my stove. I really like it! I hope you find a solution soon with all those Christmas left-overs I’m sure you will need to be heating up! I LOVE the stockings. They are simply beautiful! Enjoy your Christmas season! Hope Rob feels better quickly. On the microwave front, I most use mine for reheating or melting butter. I could probably live without it and if it weren’t over the stove I would if I had to give up counter space. On the other hand, I have a friend who uses hers faithfully. She replaces it immediately if it starts acting up. Good luck on finding the perfect one. Thanks! I have a friend who does not even have a microwave. I think it’s just what you are used to..boy when they were new, we even cooked chicken in it–and more. It was so “new-fangled” when I was a kid! The comment gremlins have struck! I have tried commenting on this post multiple times and nothing shows up. Anyway, I wanted to wish you and your’s a very Merry Christmas my friend!